If you're into all things sparkly, Christmas is just the time to go all out! 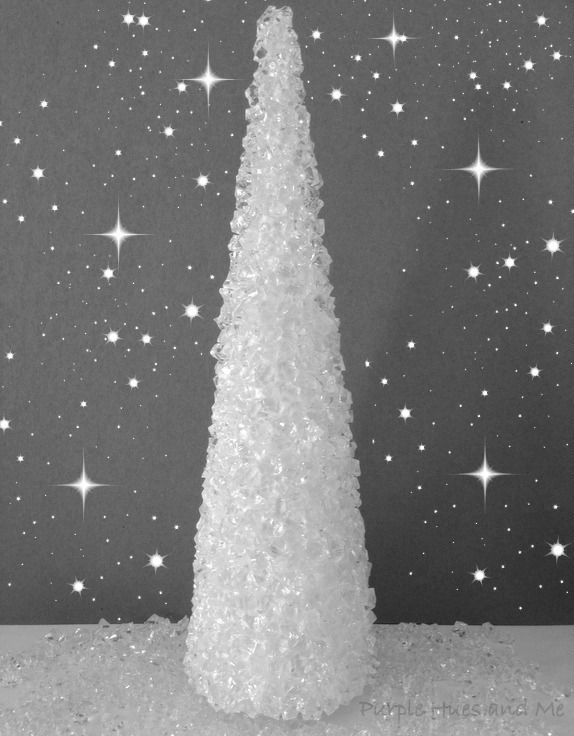 So why not glam it up this holiday season with a diy cone tree bedazzled with crystal ice fillers! Crystal ice fillers you say? You've probably seen them in vases especially decorated for weddings. But why limit yourself to vases or weddings. Begin by painting the paper mache cone white and let dry. Lay the cone tree on its' side and spread a generous amount of silicone a few inches along the bottom. You can use a craft stick to help spread the silicone. Press individual pieces of crystal fillers into the silicone. Continue spreading silicone around the bottom and adding fillers. Work at your own pace. The shape of the fillers somehow allows the crystals to "interlock" with one another by moving them around for the best fit. Press crystals together with hands to help secure and eliminate any loose fillers. Continue adding silicone and crystals to the cone as you go around and up. At first, it was easier to apply the silicone and crystals while the cone was on its' side. I could easily see everything and I thought the crystal would adhere better. The cone becomes heavier as you apply more crystals so I move it to the upright position about halfway through and continued filling in until reaching the top. The silicone does have a quick grab but needs 24 hrs to dry. Would you believe only a few (3) crystals fell off and were easy to put back on. This tree just gleams with enchanting beauty! Light bounces off beautifully and reflects off of all colorful surfaces including Christmas lights. And best of all, the tree sparkles and shines no matter what angle! Beautiful Christmas tree Gail! Love it! Beautiful Gail. This would fit right in with my Winter wonderland table. That is so pretty! I can only imagine how much it sparkles. Oh, how pretty, Gail and now I'm visualizing this technique for a gorgeous wreath! Oh I love your Christmas tree! It's very glamorous. I love everything sparkle and your tree is gorgeous Gail!! I am featuring it at this week's party, congratulations! Where did you get the white string of lights or did you make that also?